Taking place each year in March, Art Dubai presents a select yet diverse line-up of contemporary artists from the UAE and around the world, across three programmes: Contemporary; Modern, devoted to masters from the Middle East, Africa and South Asia; and Marker, a curated section of artspaces that focuses each year on a particular theme or geography. Disrupting expected images of South Africa, the 25 contemporary artists and collectives featured in Public Intimacy eloquently explore the poetics and politics of the everyday. This collaboration with Yerba Buena Center for the Arts presents pictures from SFMOMA’s collection of South African photography alongside works in a broad range of media, including video, painting, sculpture, performance, and publications — most made in the last five years, and many on view for the first time on the West Coast. Coinciding with the 20th anniversary of democracy in South Africa, Public Intimacy reveals the nuances of human interaction in a country still undergoing significant change, vividly showing public life there in a more complex light. Public Intimacy includes works by Ian Berry, Ernest Cole, David Goldblatt, Handspring Puppet Company, Nicholas Hlobo, ijusi (Garth Walker), Anton Kannemeyer, William Kentridge, Donna Kukama, Terry Kurgan, Sabelo Mlangeni, Santu Mofokeng, Billy Monk, Zanele Muholi, Sello Pesa and Vaughn Sadie with Ntsoana Contemporary Dance Theatre, Cameron Platter, Lindeka Qampi, Jo Ractliffe, Athi-Patra Ruga, Berni Searle, Penny Siopis, Mikhael Subotzky and Patrick Waterhouse, and Kemang Wa Lehulere. 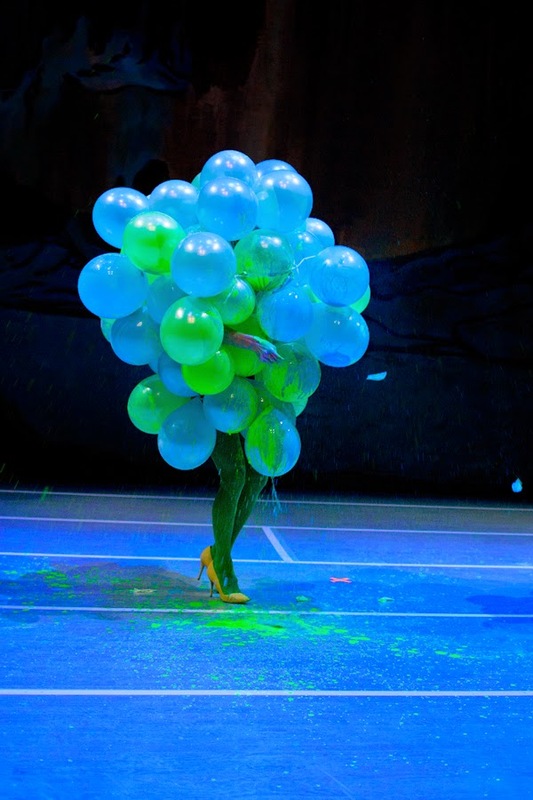 Athi-Patra Ruga's ongoing performance series The Future White Women of Azania (2010‒present) features fantastical characters — usually played by the artist — whose upper bodies sprout colorful, liquid-filled balloons, while their lower bodies pose or move in stockings and heels. 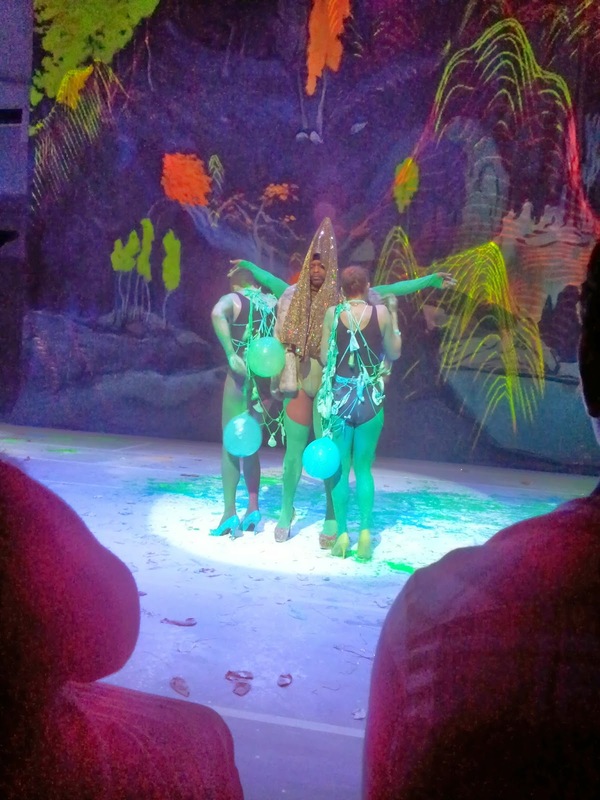 Drawn from both classical Greek and Roman accounts of southern Africa and activists' dreams of a pre- and post-apartheid black African utopia, Ruga's Azania occurs as a state in flux: the Future White Women's liquid-filled balloons droop and pop, and the character dissolves to reveal a performer. Ruga's new work, The Elder of Azania, introduces another shape-shifter: a spiritual figure, both king and trickster, both Xhosa's goat spirit and Vaslav Nijinsky's famous faun. Athi-Patra Ruga & Studio (PTYLTD) is pleased to announce the recipient of the 2015 Standard Bank Young Artist Award for Performance. The Standard Bank Young Artist Award is arguably the most prestigious accolade to be awarded in South Africa, and is given to young South African artists who have demonstrated exceptional ability in their chosen fields. Designed to encourage the recipients in the pursuit of their careers, a key aspect of the awards is that they guarantee the artists a place on the main programme of the next National Arts Festival. 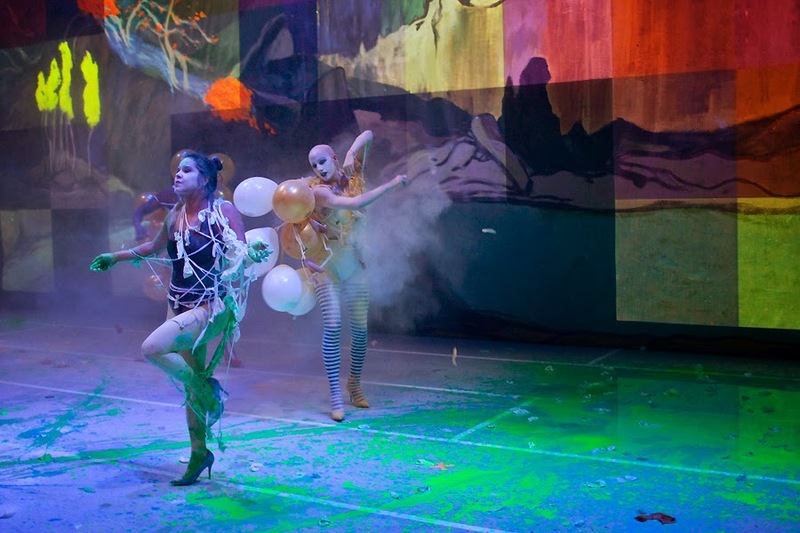 In addition to a cash prize, each of the winners receive substantial financial backing for their Festival participation, whether this involves the mounting of an exhibition or the staging of a production. 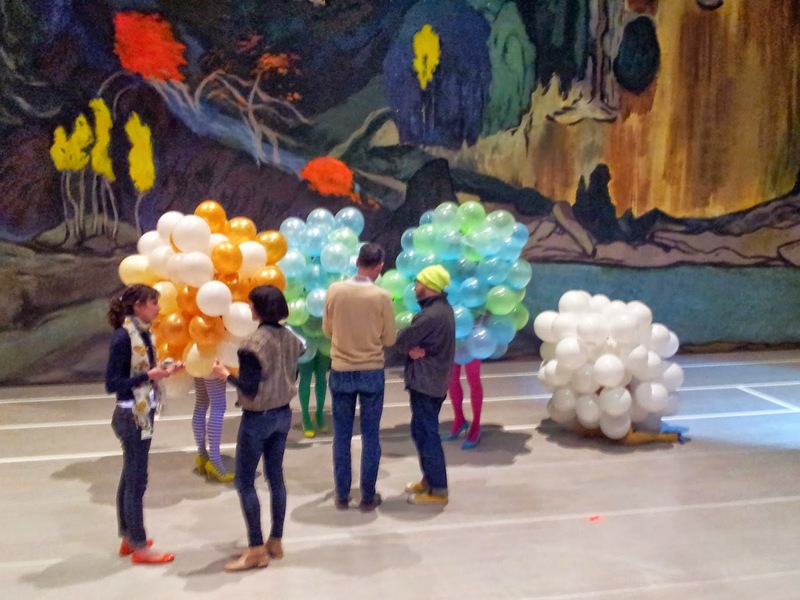 Ruga's performance pieces are a combination of processions and interventions, using the procession as a way in which to extend and deepen communication with the audience. Ruga's most recent and ambitious work titled The Future White Woman of Azania is an ongoing series of performances engaging new definitions of nationhood in relation to the autonomous body. Other themes in Ruga's works are the interrogation of utopic ideals and rhetoric, racial ideologies and the body as a communicative tool. 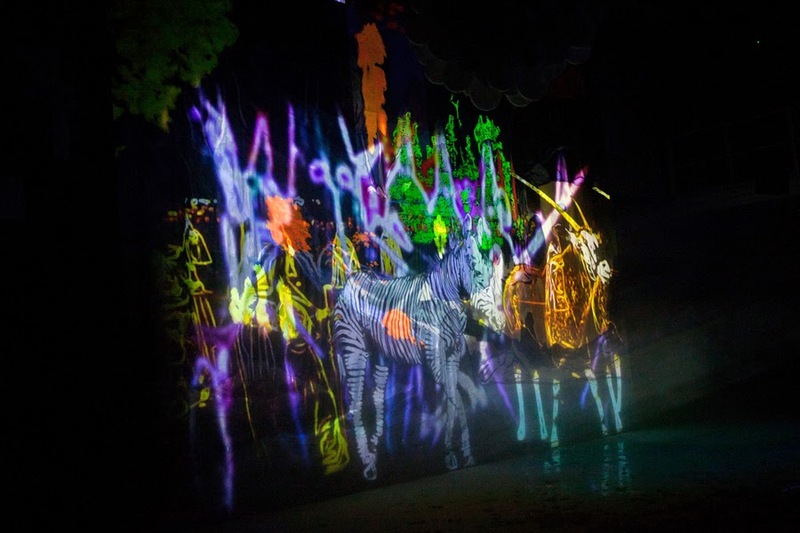 Recent performances include The Founding Myth staged for the opening of the South African pavilion at the 55th Venice Biennale; The Elder of Azania commissioned by the Museum of Modern Art San Francisco and YBCA as part of the exhibition 'Public Intimacy'; and Next Future hosted at the Gulbenkian Foundation in Lisbon Portugal. Jenkinson,Brontez Purnell, & Mica Sigourneys. WHATIFTHEWORLD is pleased to present new work by Athi-Patra Ruga, Cameron Platter and Dan Halter at booth B2 at VOLTA10 in Basel, Switzerland from 16 to 21 June. VOLTA is Basel’s renowned platform for presenting the vision of contemporary art galleries of global prestige whose artists represent new and relevant positions for curators and collectors alike. Conceived to bridge a gap between Basel’s pre-existing fairs, VOLTA showcases galleries – whether young or mature – that choose to work with the most exciting emerging artists. These galleries must keep deeply meaningful connections with their artists and follow them throughout their careers. In turn, select galleries exhibit in the airy rotunda surroundings of Basel’s Markthalle, elevating their own platforms for an experience mutually beneficial to fair visitors and the galleries alike. For further information on VOLTA10, please click here. 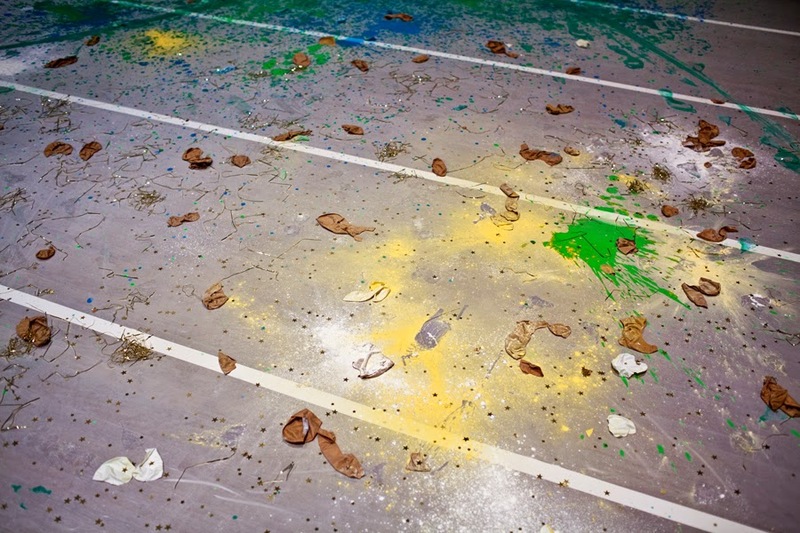 After the participation at VOLTA10 in Basel, Switzerland from 16 to 21 June, WHATIFTHEWORLD is pleased to announce the very successful outcome with almost all of Athi-Patra Ruga’s works being sold. Ruga’s solo representation at VOLTA10 also received international museum exhibition interest, including a private foundation in New York. VOLTA was founded in Basel in 2005 by dealers Kavi Gupta (Chicago), Ulrich Voges (Frankfurt), and Friedrich Loock (Berlin). Athi-Patra Ruga is a hastily ascending young artist whose approach is one of wilful confrontation, underpinned nonetheless by a finely honed aesthetic sensibility. Athi Patra Ruga’s current work interrogates issues of sexuality, gender politics and the complexities of first and third world influences in contemporary South Africa. 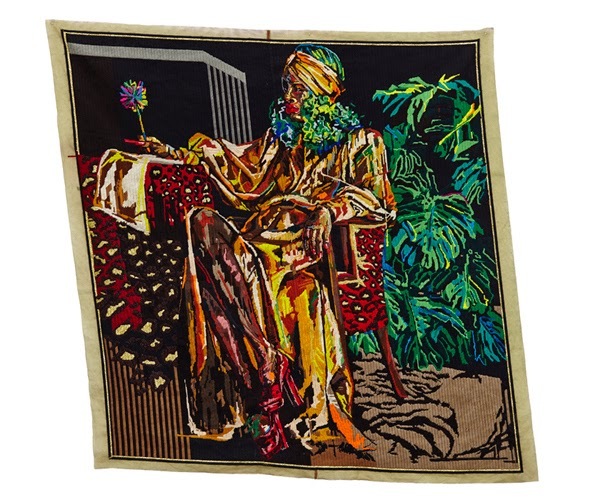 Drawing on a diverse range of influences from traditional Xhosa folklore, hip hop culture and the material aspirations of the rising South African black elite, Rugas work is manifest through textiles, video, performance, interventions, and photography. 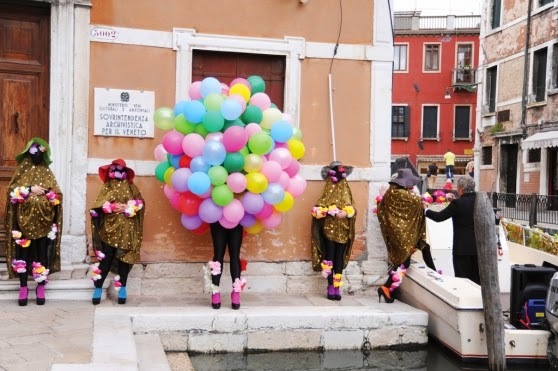 Born in Umtata South Africa Athi Patra Ruga has had two solo exhibitions in South Africa and has exhibited extensively abroad, notably at the Dakar Biennale in Senegal, the 3rd Guangzhou triannle, Guangzhou China, the IFA Gallery Berlin and the Stenersent Museet in Norway. The Future White Woman of Azania is an ongoing series of performances first conceived in 2010 and evolving to engage new definitions of nationhood in relation to the autonomous body. 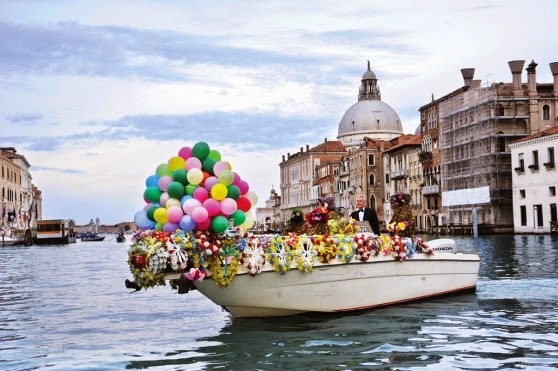 In the enactment of the site-specific work commissioned for the 55th Venice Biennale, the performance takes the form of an absurdist funerary procession. The participants are the ABODADE - the sisterhood order of Azania and the central protagonist - The Future White Woman. Seeking to radically reimage the potential of Azania and its inhabitants, the performance questions the mythical place that we mourn for and asks who its future inhabitants may be. Using the “Nation-Finding language of pomp and procession” , Ruga proposes a bold and iconoclastic break with the past Utopian promise of the elders and instead presents us with a new potential and hybridity . 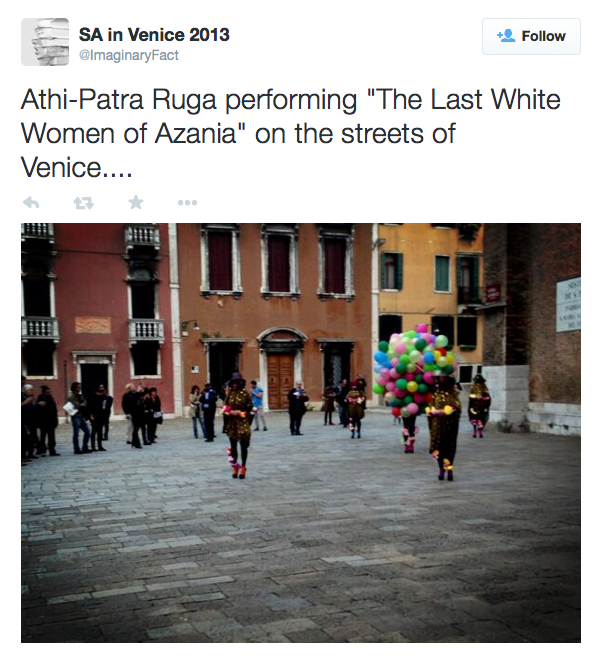 The Future White Women of Azania: The Trial, a performance art work by Athi-Patra Ruga. C& Interview: Pamella Dlungwana talks to Athi-Patra Ruga about his artistic and performative practice. "There is a need for me to constantly re-invent the self." Our author Pamella Dlungwana talks to Athi-Patra Ruga about his artistic and performative practice. 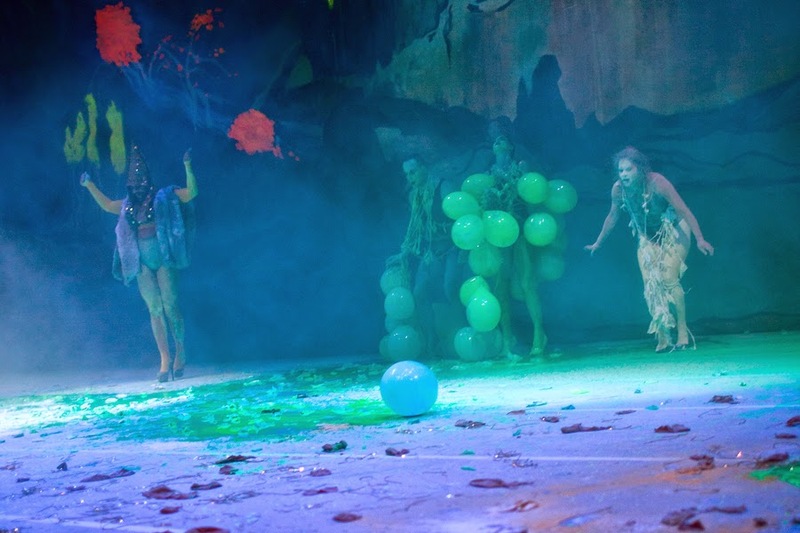 Pamella Dlungwana: Is Athi-Patra a perpetual performance because you weren’t born and named such? Athi-Patra Ruga: Okay, I was born Athenkosi Luphelele Ruga and I really hated my name. Not for any particular reason, it was just so long and so traumatic to have it and it was also an inconvenience to have people say my name, it would stunt conversation somehow. But that also served my purpose because I am a happy introvert. But Athi is a shorter name for Athenkosi. I remember that growing up I was quite a big kid and I used to dance a lot to music videos, I would record them, especially the dance hall music videos. I loved the dance hall queen Patra and instead of doing aerobics I would record her videos and emulate her moves. So my sister, my mother and niece started calling me Patra and so I slapped those two together and they sounded good. I thought that I could use them in whatever I did in the future, my future trade to create a brand and I think that a brand is a promise of good quality. PD: So he’s a construct? APR: It’s a construct; it’s a very deliberate, very telling construct. I think that it is a character in itself; it is me dealing with such a damned long name. It’s a testament to my need for constantly re-inventing myself. I think there is a need for my generation and for me to constantly re-invent the self. That’s why I call it a brand because it represents those things. There’s a moment where one can live with how they are defined by others and a moment where that needs to stop and the definition needs to come from the self. I think that’s why I keep it on and I think it’s also quite evident in the constant invention of the characters. I find it interesting that you brought that out, the construction of my name and the characters I perform. PD: One could take your being an artist as an accident of fashion, but when did you have your first mediation on becoming an artist? APR: I think this is the first time I’ve been asked that. I went to a school that was very rugby, cadets and riffling focused but there were busses that bussed seniors to Belgravia Art School to attend art classes and I wanted to join them to escape these macho spaces. So I attended art school and high school at the same time. That is where my love for art began. Then Irma Stern came in, because people think that the Irma Stern works started when I started practicing as an artist but it was much earlier. PD: So Irma Stern is a much earlier influence. 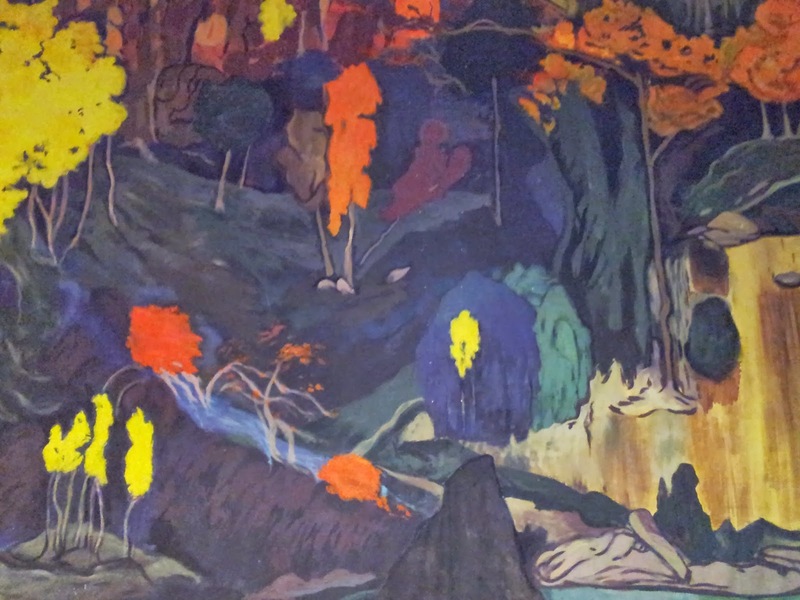 APR : Yes, I found an Irma Stern book and it influenced the way I painted, how I drafted and used color. So it was my color education and it was autodidactic because I was not satisfied with the art education I was getting. It revolved around the Laubschers with some mentions of the Sekotos, but no mention of contemporary art. PD: And when did you first come across contemporary art? 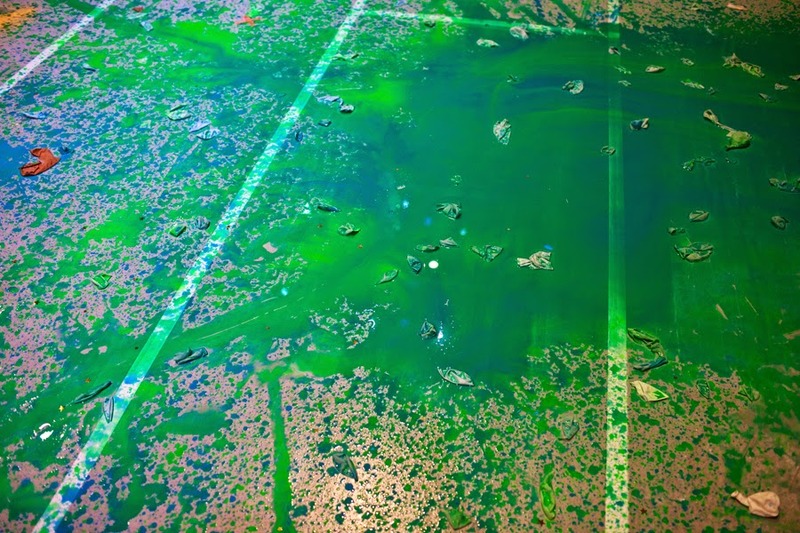 APR: I do remember them [at school] rushing us through ‘Happenings’, a progeny of abstract expressionism and actionism. I did my first performance in early high school, where I used vintage Calvin Klein jeans I’d bought from a Salvation Army shop. I was discovering what Calvinism was and on my walks there was a Jehova’s Witnesses space and they had painted a whole wall white. I posted my jeans on that wall and declared I’d created a white Calvinist. It didn’t go down well with my teacher. It was the first time I used protest, a very passive-aggressive form, but still in a stylized way. So I had to devise graphic nuances that articulate the things that were irking me without getting a smack down. I think that’s the role that art plays with me, where everything gets refracted and a double game is played. PD: What role does fashion play in your work? 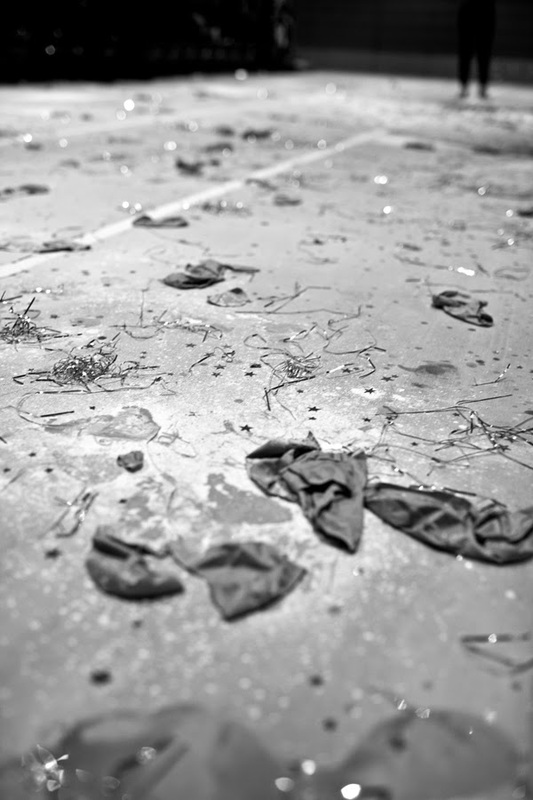 APR: I dematerialized out of the idea of fashion, to an extent that it becomes not purely the fashion industry but becomes the medium, the design, it becomes problem solving and not raising questions the way art does. You walk into the studio and you don’t want cheese, you are there to solve problems and design works with me in that way. I love the fact that there’s emotiveness to it. Fashion is not about the objects that reapply themselves and ‘come back’. Fashion by definition is and depends on how you can fashion people. I believe that the design of it, the way it engineers a body is what is of interest to me and what links me to performance. APR: Yes, fashion comes from a Latin word meaning ‘to change.’ So the body becomes this thing that needs to be fashioned. You’ve got this medium that really needs a body to sit in a certain way if you’re wearing a certain cut and for the body to stand in a certain way. The fact that Xhosa women wear circle skirts to accentuate their hips and all of that, this is performance, this is fashion. These are two mediums working with ideas of perception and what comes out of that mixture is art because of its elementaries. This is how I decided to go to couture school; I could not speak about fashion without knowing about it. APR: I made clothes and they ended up assuming a sculptural, non-utilitarian aspect, as in wearing them. They ended up becoming almost soft sculptures and this was a point where I started wearing them because I wanted to put my neck on the chopping line. I wanted those clothes to be my great choreographer and I still believe that the costumes I wear are some kind of a choreographer that is beyond me because they deal with perception; they deal with how other people respond to me. At around the same time, Johannesburg’s inner city was undergoing gentrification, there were forced removals and I lived very close to where much of this was happening and this is where my first character, Miss Congo, was born because in Johannesburg you’re a sheep among wolves. At that time I was interested in procession, cleansing, performance, and ritual. Miss Congo went to a site in downtown Johannesburg where Gito Baloi was killed and had her first performance. Soon after that I went to Kinshasa, which was a dream come true really because she became Miss Congo in Kin and not a Troyville or Yeoville stereotype of who Miss Congo was. “Miss Congo”, 2007, Videostills, 13:32 Min. PD: Did Miss Congo die? You’re in the habit of killing characters. APR: No, she didn’t die, she didn’t suffer violence. She is one of those characters who live in a ‘perpetual other space’, with characters like Ilulwane. Injibaba died, Beiruth died, and the Futurewhitewomenofazania cannot die because it lives inside something that I’m constantly reaching for. PD: Why do you let some of them live and others die? APR: They are all heavily built into the narrative. Injibaba for instance started as a costume for which I longed to work with the notion of brutalism, which is a style of architecture, and I wanted to create a sculpture that addressed this. I bought wigs and created this brutalist shape. Also, I was on my way to Switzerland and on first arriving there, I was confronted with this campaign poster from the right-wing Swiss People’s Party showing the swiss flag with white sheep kicking a black sheep out. I went to Zurich to interact with black people there during Election Day. I was still in Switzerland and I wanted to kill the character because I couldn’t take her home with me. PD: You’ve let the Futurewhitewomenofazania, your only pluralistic character, live outside the ‘perpetual other space’ reserved for her predecessors for much longer. Why? APR: For the first time I wanted to bring a whole pantheism of characters, I wanted to bring a whole lot of characters, the need to assume different characters. The first time I wore the outfit, I felt this weight, liters of water weighing me down. I remember the catharsis that came after the amazing pain from the weight I was carrying to slowly being unweighted. I walk and I see this fear, people clutch their bags and this made me ask why people are weighed down by so much fear. FWWOA are a frivolous, light apparition that disturbs the burden of fear people have with black men, that interrogates the way black men treat black women in relation to white women and it also addresses the notion of white women as aspirational characters. The conversation is obviously ongoing. 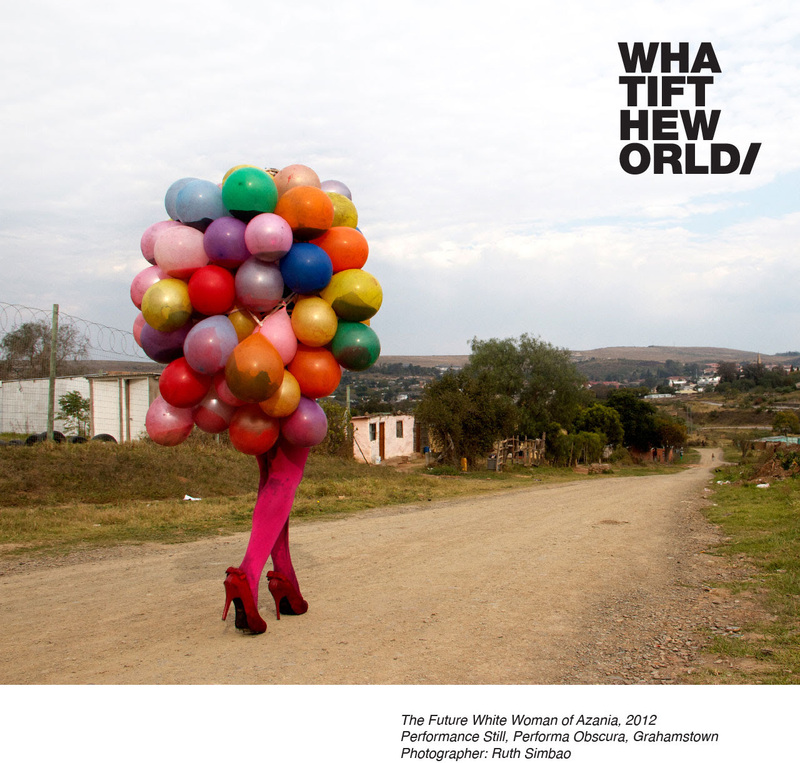 Athi-Patra Rugas’ solo exhibition,The Future of White Women of Azania, Whatiftheworld, 27 November 2013 – 8 February 2014, Cape Town. Ruga is also part of the group show PERHAPS ALL THE DRAGONS IN OUR LIVES ARE PRINCESSES – ON SOMATIC MORPHING, Savvy Contemporary, 19 January – 15 February 2014, Berlin. Pamella Dlungwana is a Cape Town based researcher and coordinator. 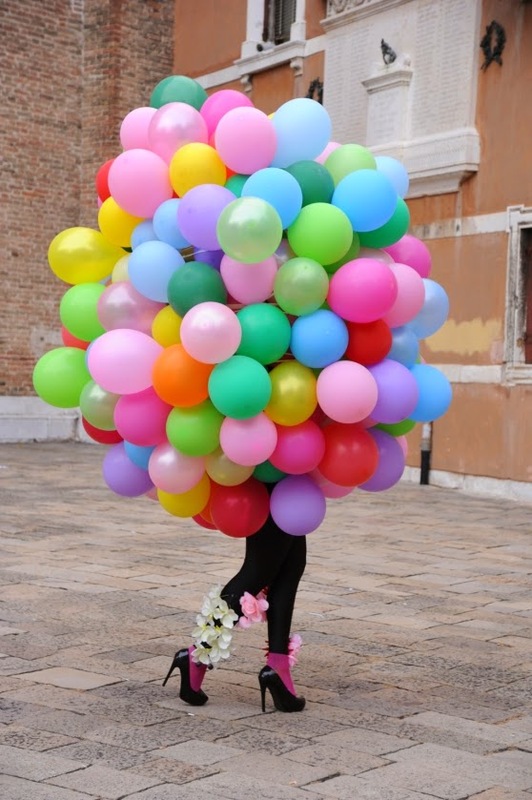 Exploring the border-zones between fashion, performance and contemporary art, Athi-Patra Ruga makes work that exposes and subverts the body in relation to structure, ideology and politics. Bursting with eclectic multicultural references, carnal sensuality and a dislocated undercurrent of humor, his performances, videos, costumes and photographic images create a world where cultural identity is no longer determined by geographical origins, ancestry or biological disposition, but is increasingly becoming a hybrid construct. A Utopian counter-proposal to the sad dogma of the division between mind and body, sensuality and intelligence, pop culture, craft and fine art, his works expresses the eroticism of knowledge and reconciles the dream with experience.